With so much talk about autonomous vehicles and their potential usurping of the trucker job market in the recent months, other big ventures from emerging companies have often gone overlooked. Recently, however, the company which has possibly had the largest impact on how people look at vehicles has expressed their interest into delving into the trucking industry. Since late last year, Uber Technologies, the transportation network company, or a new look on the taxi service, after buying the autonomous truck startup Otto, has been working towards putting their trucks on the road. Though it has yet to come to fruition, Uber Freight has already faced their fair share of controversy. As of May 10, Uber Freight has a website up and running, there is not information as to exactly what it is, though they do have the option for shippers, dispatchers, owner operators, and company drivers to sign up with Uber Freight. As for terms and conditions and contractual obligations, visitors to the site are redirected to the original Uber terms. Some sources online even have job listings for positions with the company, including some positions in Florida. As mentioned above, Uber first approached the idea when they bought out Otto in August of 2016. On August 18, Travis Kalanick, the CEO and co-founder of Uber, announced that the company had acquired Otto, which they described as a, “...90 plus person technology startup whose mission is to rethink transportation, starting with self driving trucks.” Along with the company itself, Uber would also bring with them the co-founder of Otto, Anthony Levandowski, to lead both in a combined effort to produce the best autonomous trucks available. According to Kalanick, the combined efforts of Uber and Otto made for a trucking industry dream team due to the fact they were able to combine knowledge of ridesharing and also experience in data and intelligence. While he also used this as an announcement to inform the industry of a future partnership with Volvo to manufacture the safest vehicle with self-driving technology, it was the ideas that came with Otto which has caused them trouble. 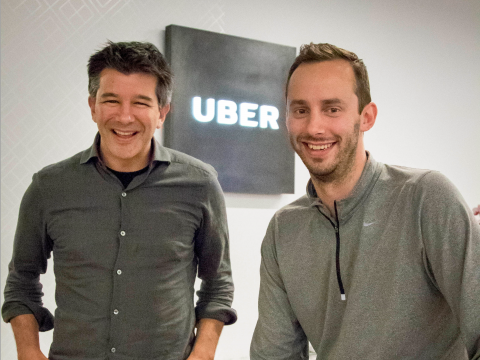 What was not explored within the press release given by Uber was the fact that not only had Levandowski worked as a high-level employee at Google, but so had another team member with Otto, Lior Ron. Interestingly, at the time of the announcement, Otto was only a startup which had begun six months previously, meaning it is still just barely over a year old. Still, within those six months of their startup and joining with Uber, they had four trucks on the road and were working closely on the technology that would allow them to make already existing trucks be able to convert over to an autonomous trucking job by simply installing a $30,000 kit from Otto. This sounds like it could have been the Cinderella story Otto needed and the way to edge themselves into the trucking industry that Uber needed, but it was only a few months later when the now joint company faced their first major problem – a lawsuit. Of course, huge companies such as this are used to lawsuits, or at least know how to handle them, but this was not just a run of the mill lawsuit, it was filed by an even bigger powerhouse – Google. While this may not seem like much considering the fact that many companies out there are also working on their own self-driving technology, but Waymo feels that the Otto leaders who came over to head the Uber Freight project stole previously existing technology that was created during their time at Waymo. According to the case document, Waymo was able to find evidence which showed that Levandowski, who began as a manager at their autonomous car project had downloaded, “...more than 14,000 highly confidential files shortly before his resignation.” They further this statement by saying that these files included the designs for Waymo's LiDAR circuit board, which is the same design as that of what Uber plans to use. He also went very far out of his way in order to conceal his actions. This has caused many to question whether or not Uber was aware that Otto had acquired these files. What makes this case even more strange is the fact that back in October of 2016, long before the case was even filed, Levandowski gave a leading business magazine a demo of the Uber project. While that is obviously not the strange part, it seems that Levandowski went out of his way to explain during the interview that he did not use any part of the technology he had learned at Google to work on any of the current projects he had going on at Uber. He even went so far as to say, “We did not steal any Google IP. Just want to make sure, super clear on that. We built everything from scratch...” Still, only four months later, Google and Waymo felt that this was far from the truth. Another red flag in this interesting case is that Waymo insists Levandowski met with Uber leaders mid-January 2016 then resigned without any sort of notice only 13 days later, on January 27. Not even a week later, Levandowski had launched Otto. Uber Freight - Coming Soon? Even through all of this controversy, it seems as if Uber is working diligently to release their division of Uber Freight. Some speculate that the company may make an appearance at GATS this August in Texas, though nothing has been confirmed. While they have stayed silent about the endeavor, whether it is due to the lawsuit or other reasons, Kalanick has recently left it up to social media to generate buzz about what is coming up with their trucking division. 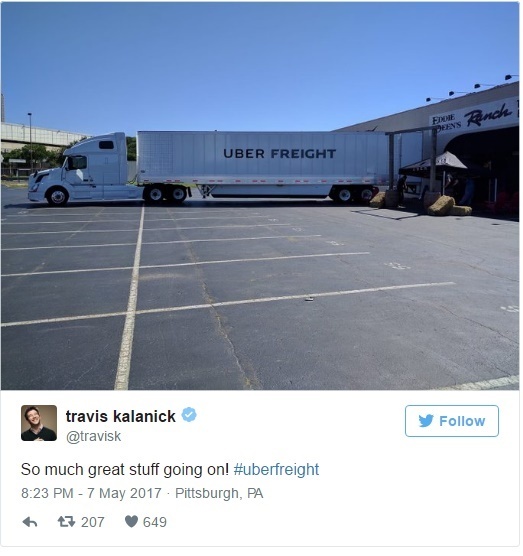 Kalanick shared a picture of a seemingly regular semi on Twitter, but with the words Uber Freight emblazoned on the side. Oddly enough, the picture seems to be taken in Pittsburgh, Pennsylvania where Uber first began their venture into autonomous vehicles, but Otto is a San Francisco based company. Though it seems as if Uber Technologies has not yet given up completely on their autonomous semi truck technology, the company still leaves much to be desired as very few details other than that picture have recently come to light. Originally, it was discovered that Uber Freight would run much like their original Uber application in the sense that a shipping company could hire an individual truck, much like a person can request a driver. Now, though, it seems as if Uber Freight wants to employ their own team of semis. By doing this, it also means that they will be responsible for all the price requirements that go into owning and maintaining a fleet – everything from fuel costs to making sure a particular truck driving job get filled. Another interesting about the picture that Kalanick posted to Twitter is that rather than a souped up semi truck equipped with the autonomous technology people have previously seen on Otto vehicles, it instead looks much like any truck one may see on the road any given day or even drive in themselves. This is why the release of the photo is both exciting and slightly confusing considering everything that is going on within Uber and their partnership with Otto and obviously the lawsuit they face. Needless to say, it is far less exciting looking than their first combined project late last October when one of the Otto trucks were able to complete a 120-mile drive in Colorado in order to move 51,744 cans of Budweiser. Even then, however, it was not a venture that was wholly embraced. Several precautions were taken to ensure that the semi would have the safest trek by first having two tow trucks drive the exact route the Otto would take to make sure that the road was clear of debris and vehicles which may have been parked along the road. The truck was also surrounded by four state patrol cars and an additional three cars driven by Otto employees. It was also necessary for a driver to take the route several times in the Otto vehicle to ensure they would not run into problems. Still, the semi autonomous vehicle was only capable of driving down the highway and still needed the driver to manually move the semi on and off of the exits and regular roadways. While Uber was undoubtedly smart to invest in self-driving technology, between the lawsuit they face and their seemingly slow progress of the Uber Freight, it also shows there is a long way to go before it comes to fruition.